Hello all! Happy to be here thanks to TBPMods/Kevin for introducing me to the fantastic supplier that is DazMode. I've been a builder and gamer for as long as I can remember, with a few years breaks in between for business and personal reasons. I've been back in PC building and gaming heavily over the last couple years, and built myself a nice system with an AIO cooler. I was bitten by the upgrade bug again a few weeks ago and I'm going downhill hard and fast. I repair and sell MacBooks as a side business (shameless plug! www.onebitetechnology.ca) and that has funded this entire build. Thanks Apple! 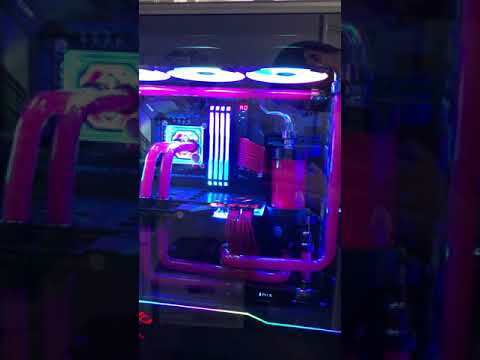 This is my first hard loop, and I was looking for (close to) perfection and clean design. It's taken me about 3 weeks, and I'm very happy with the result! Cooling: EK GPU & CPU Block, Reservoir, 360mm and a 280mm rad. Barrow temp sensor looks cool. Thanks! I just happened upon it by chance while browsing for fittings and thought it would go nicely in that corner. so excited to see this finally posted!